These past few weeks have been quite nostalgia filled. You see, I’ve been taking trips down memory lane. Returning to favourite past-times and childhood loves. Everything from books to films and songs to foods. In times of much needed comfort and reprieve, nothing is more healing than re-visiting old-favourites past. I’ve dived into the dog-eared pages of Nancy Drew and The Hardy Boys. I opted to watch The Pink Panther and A Series of Unfortunate Events. I listened and purchased sentimental tracks. I purchased a packet of much beloved Banana Paddle Pops. And today, I even devoured Fairy Bread; a generous slather of butter, a flourish of hundreds and thousands, all piled on-top store bought slices of white bread – childhood transcendence. And oh has it been good. Returning to these favourites from my youth has given me such immense pleasure. A reminder that whilst I may forget, I can never truly outgrow. It’s not that I’ve ever stopped enjoying these favourites from my early years, but like everything else in life, they just got lost somewhere in the process of growing up. Which brings me to these Brown Butter Blondies with Salted Speculoos Frosting. These blondies encompass the true flavours of my childhood. Speculoos cookies were a frequent after-school treat. A (too) quickly devoured snack that when accompanied with a tall glass of milk, lovingly welcomed me home. Though, as I grew, my love for the Dutch cookies faded – replaced by new food obsessions and flavours. Having them all-too often, rendered me unable to appreciate their comforting taste and appeal. That is until recently, when a jar of speculoos cookie butter appeared in my life. Who knew that a butter spread could be made out of my favourite childhood cookies! I had to try it. And it was magical. Once again, I felt returned to my youth. These Brown Butter Blondies with Salted Speculoos Frosting are all the flavours I loved and appreciated as a child, dressed up. 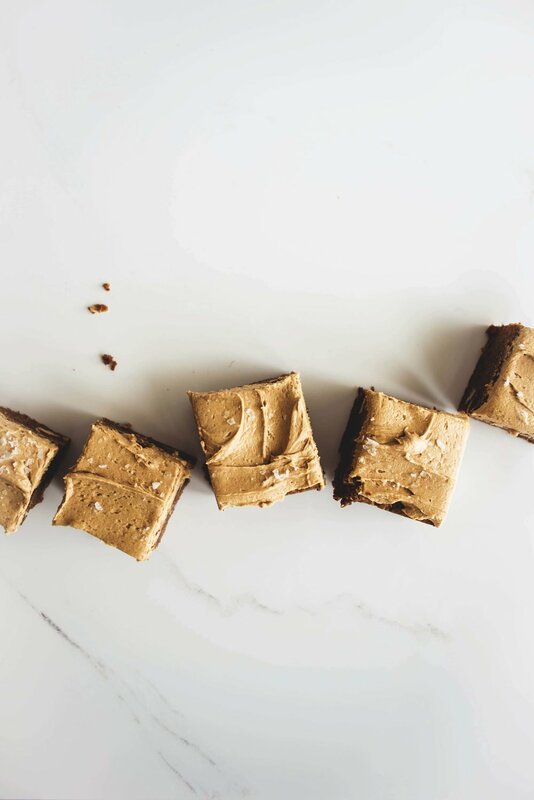 An incredibly sweet, fudgy and delicious blondie bar is elevated to a new level by the addition of a slightly spiced and salted speculoos butter frosting. The blondies are further benefited by the addition of browned butter to the batter, which yields the most addictive bar, with an intense, deep and nutty undertone. I opted to use salted butter in the frosting too as I find it yields a more complex flavour layer to the overall flavour and really allows the speculoos spice to shine. I do recommend using a speculoos butter spread but if you can't find it you could easily substitute it for any other spread that takes your fancy – like peanut, chocolate or even another cookie butter too. Either way, these blondies are delicious. Brown Butter Blondies with Salted Speculoos Frosting are insanely addictive. I do vouch that they will transport you to the happiest of places. Also, if you’re willing to share, I would love to hear about your childhood favourites. And in doing so, I hope you too, just as I, will re-discover some magic. Pre-heat the oven to 350 F / 180 C. Line a 8 inch / 20 cm square baking pan with parchment paper, leaving an overhang around each side. Lightly grease the parchment paper with butter. Set aside until needed. Whisk together the flour, baking powder and cinnamon in a medium bowl. Set aside. In a medium sized saucepan, melt the butter over medium low heat, swirling it around until it is nutty brown in colour. Remove the pan from the heat and with a wooden spoon, mix in the brown sugar, vanilla and salt until smooth and lump free. Quickly stir in the eggs and mix until well combined. Pour the liquid ingredients into the dry ingredients, followed by the toasted walnuts and white chocolate. Fold the mixture together until just combined. Spread the batter evenly into the prepared pan and smooth out the top. Bake for 25 to 30 minutes, until golden, shiny and the top has slightly cracked. [i]Do not overbake! [/i] Remove from the oven and let cool on a wire rack to room temperature before lifting out from the pan and generously frosting. In the bowl of a stand mixer fitted with the beater attachment, or with hand held electric beaters, beat the butter on low speed for 1 minute until just smooth. Add the icing sugar to the bowl, increase the mixer speed to medium and continue to beat until combined. Pause mixing and scrape down the sides of the bowl then add the Speculoos spread, vanilla, and cinnamon. Continue mixing on medium-high speed until the frosting is thick, light and fluffy, about 3 to 4 minutes. Generously frost the cooled blondies and finish with a sprinkle of flaky sea salt before cutting into even squares.